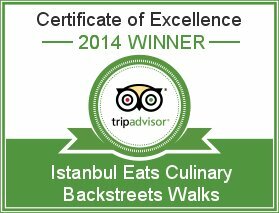 Editor’s note: Along with Dürümzade, Istanbul Eats favorite Kızılkayalar was also featured in the recent episode of Anthony Bourdain’s “No Reservations.” The Taksim veteran’s famous “wet burgers” – which Bourdain seemed to enjoy immensely – came in 3rd place in our recent “Top 5 Istanbul Street Foods” competition. For those curious about these intriguing burgers, here’s our writeup from early December. 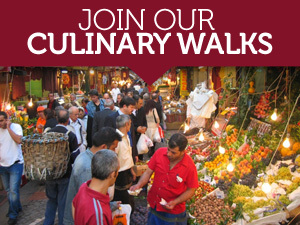 The Kızılkayalar experience starts from a distance, most vividly late at night. 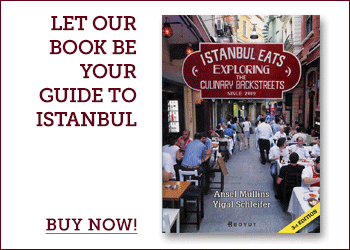 It begins with a whiff of garlic detected well across Taksim Square, then, through the bustling crowd, eyes lock onto the bright lights of the steam box holding the burger bounty. Hungry customers are finally tugged in, like a tanker on the Bosphorus, by the steady foghorn voice of the Kızılkayalar hamburger man bellowing, “Buyurun, buyurun, buyurun!” (Roughly: “Come and get it!”). Make no mistake, the burger is wet, having been doused by an oily, tomato-based sauce before incubating in a glass-lined burger hamam. There, it becomes even wetter, the once fluffy white bun rendered a greasy, finger-licking radioactive shade of orange, both chewy and slick on either side of the garlicky beef patty. Like an order of nachos at the movies, or an elephant ear at the carnival, the wet burger is a sinful pleasure that flies in the face of our otherwise high culinary standards. 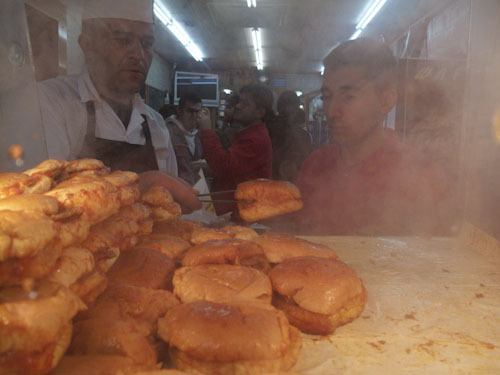 But at 2 a.m. on a Friday night, nothing is as good as a Kızılkayalar wet burger – except for another one. Though Kızılkayalar does have a cramped indoor seating area, we recommend eating it standing up out front. That way, it’s easier to fish a couple of coins from your pocket for the second round.